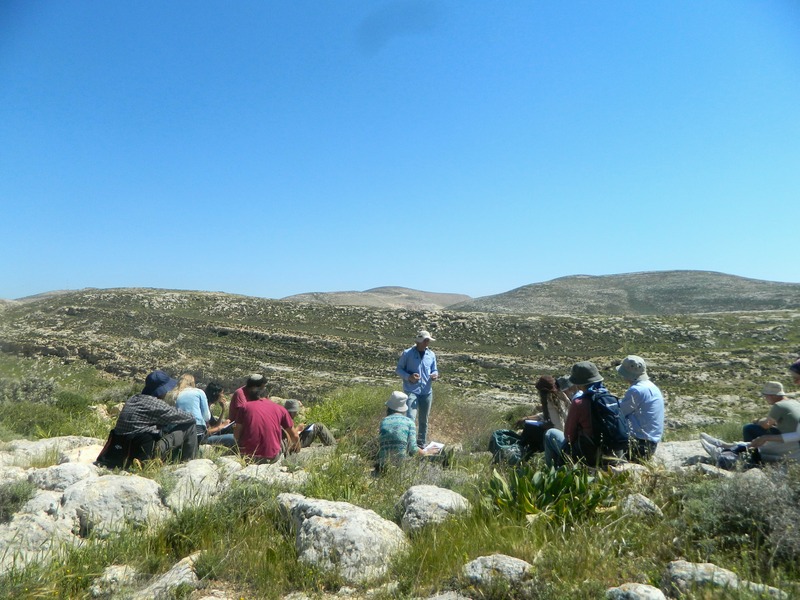 Shortly after the Bar Ilan University department trip to the Kinneret I signed up for yet another trip, this time to some rather obscure sites in the southeastern corner of the Shomron (Samaria) not far from Jerusalem. I joined my group in Jerusalem and away we drove in a bus with plexiglass windows out of the capital and into the wilderness via Hizme Checkpoint. 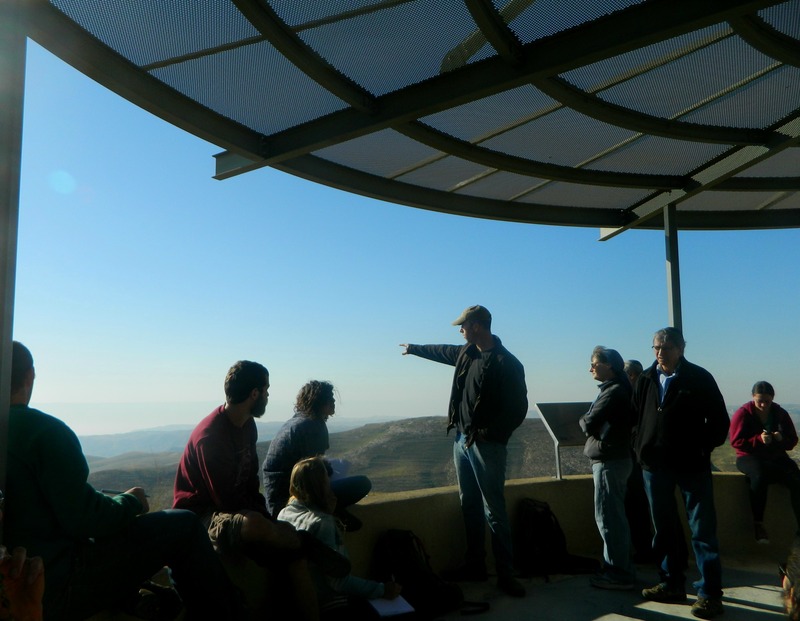 We drove past Tel Aswan and up the mountain to Mitzpe Dani for a 360° lookout and introductory lecture on the location by our guide Dr Dvir Raviv, a lecturer at BIU. Spinning in a circle at the observation deck, Dvir pointed out on the horizon the various areas of Jerusalem, the desert fortress of Herodian and, to my amazement, the twin Jordan Gate Towers in Amman, Jordan just barely visible in the haze. 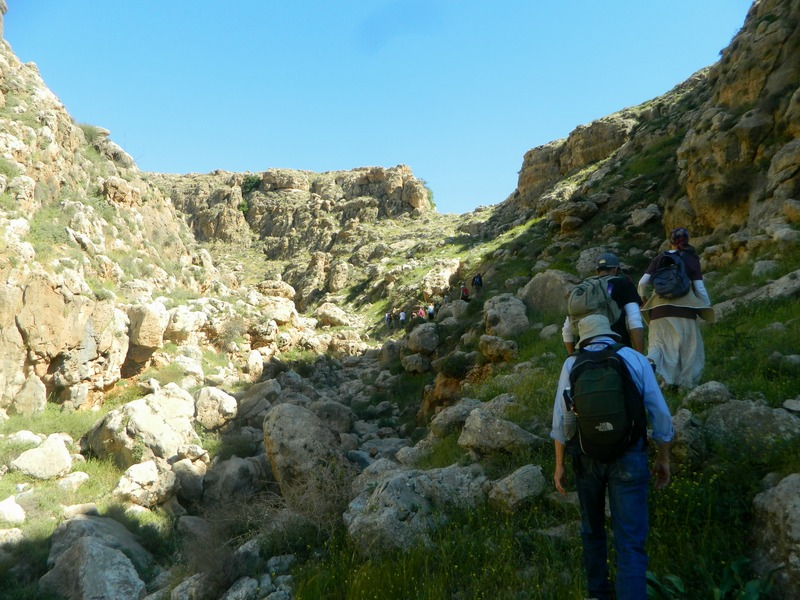 As we were located in the semi-arid mountains of the southeastern Shomron, not far from the Judean Desert, we had a brief explanatory run-down on the different topographical and historical borders of this particular region. Regrouping in the bus we drove due north on Road 548 to our next destination, Ein Samia. It was at this point that our trip became a hiking adventure. 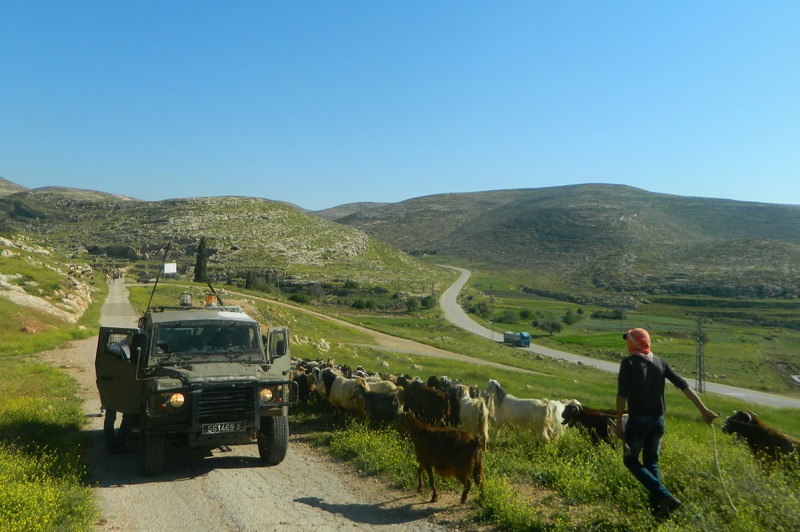 Our bus left us in the company of an army jeep and a Bedouin goatherd with his four-legged host, all of whom disappeared within mere minutes. We climbed up to a flat rock where a round shaft pit was dug into the stone, an ancient burial chamber excavated by nomads. Walking around the area we saw dozens of these nearly perfectly round shaft graves, some reaching the impressive depth of 7 metres (23 feet), a local oddity of which there are thousands. We continued on along the dirt road towards Ein Samia, crossing the old cement dam at the modern pumping station. From there we climbed up into the rocky mountainside of Wadi Auja heading for a very interesting site, Namerim Cave (translated as Leopards Cave). We heard the very unusual calls of the common raven as a pair of them patrolled the cliff edges. 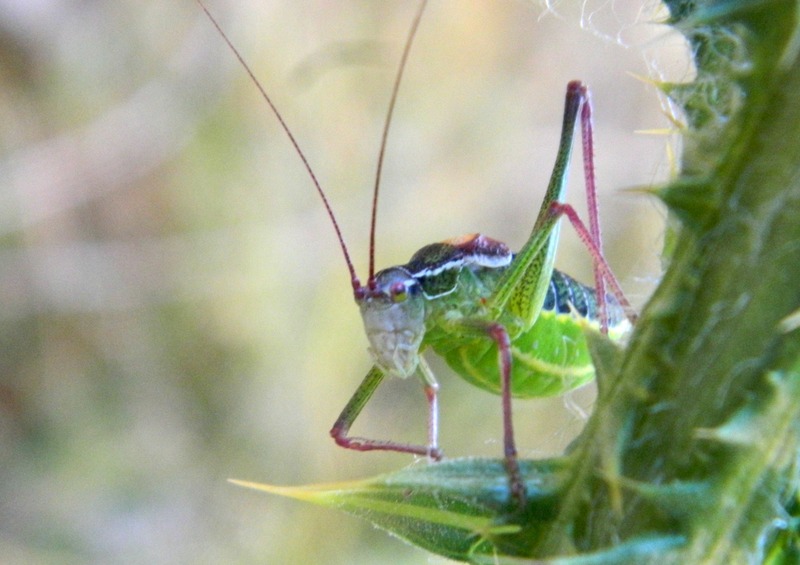 I nearly stepped on a tortoise and then took photos of a bizarre praying mantis (Empusa fasciata) and a bush cricket (Isophya savignyi). As we finally reached Namerim Cave, having climbed precariously along the cliff side, we sat down at the double-mouthed entrance to hear an entrancing story about the cave’s name – while overhead some crag martins flew. If I remember the story correctly, several decades ago there were local goatsherds who complained of a pair of leopards living somewhere in the wadi, venturing out to kill goats and even puppies of their guard dogs. The shepherds followed one of the leopards back to its lair, the cave in the cliff side, and trapped it inside. When the authorities came, answering the call, they reopened the cave and two angry and frightened leopards burst out, running away. 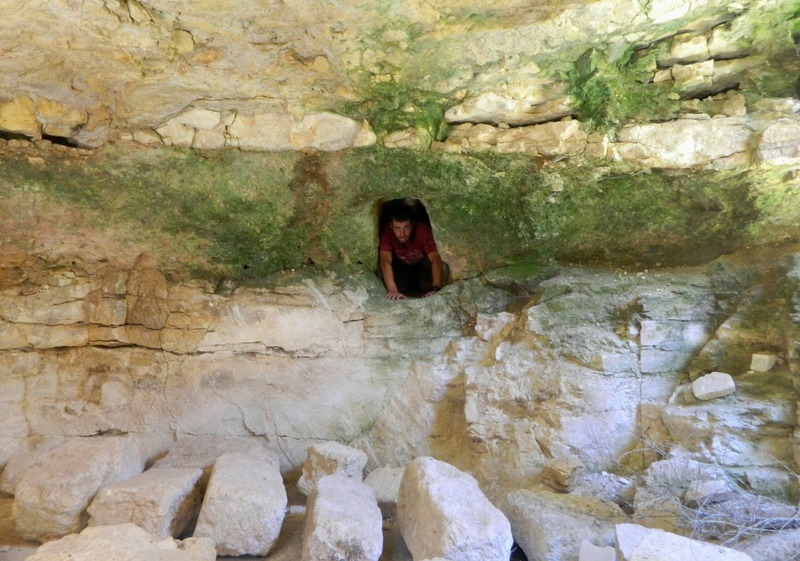 We entered the cave from the left mouth and heard about the rich archaeological finds discovered within the multi-roomed grotto, including pottery from many periods. 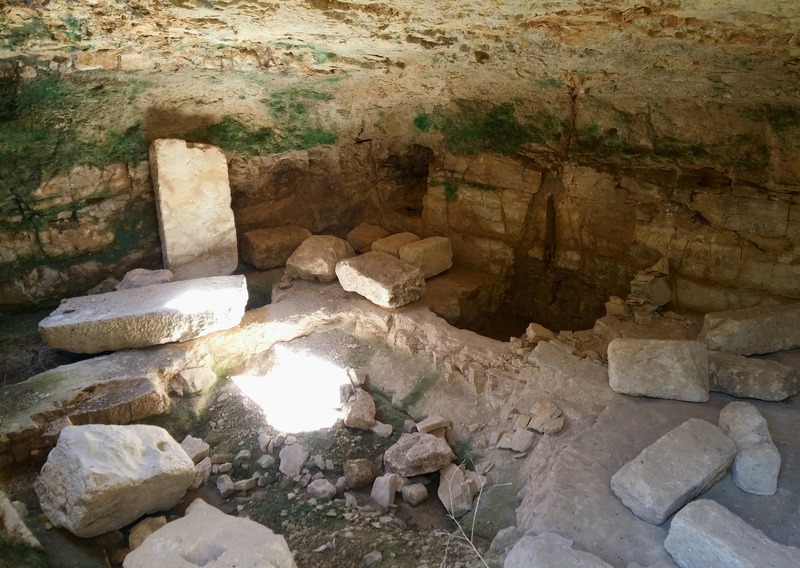 While the academic findings and research have yet to be published (consider this a sneak peek), Namerim Cave is believed to have been a place of refuge during the Hasmonean and Bar Kochba times, perhaps also used by the Samaritans who suffered persecution as well. Inside the cave I found a bone laying in the silty dirt, giving cause to all sorts of fantastic thoughts revolving around the fearsome leopards. Some of our party slithered further into the cave, entering subsequent chambers and even finding indicative potsherds, while I hung back and attempted to photograph a small bat that I was unable to identify. 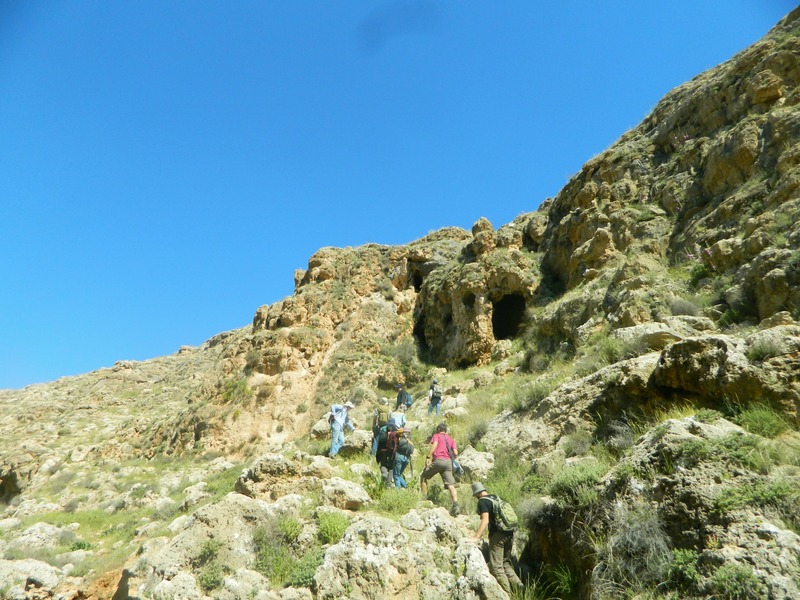 Reluctantly leaving the fascinating cave, we climbed up the side of the cliff we hiked along to the plateau of Khirbet Marajama, an ancient fortified Israelite city. Not too much is known about the city but the city walls are said to be historically significant. From Khirbet Marjama we walked down the steep slope on the opposite side, facing an aqueduct, bridge and flour mill which is either Roman or Ottoman, depending who you ask. As we looped back around towards Ein Samia we interrupted some Arab looters who were pilfering the dirt in one of the excavated ruins hoping to find valuable artefacts. They scurried off and a call was made to alert authorities, a very interesting turn of events to happen so quickly. 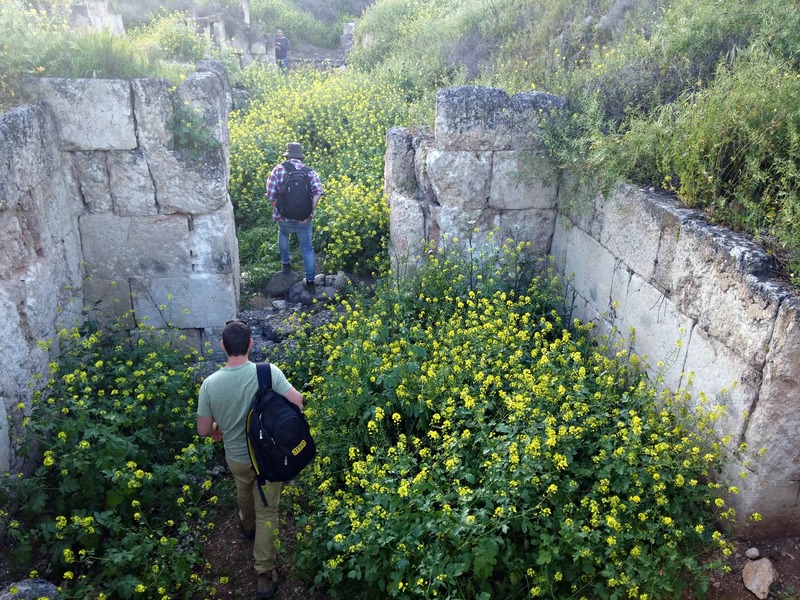 Back on the bus and driving westward to the entrance of Beit El, we disembarked once again to visit the last site on our list for the day, Et-Tell. 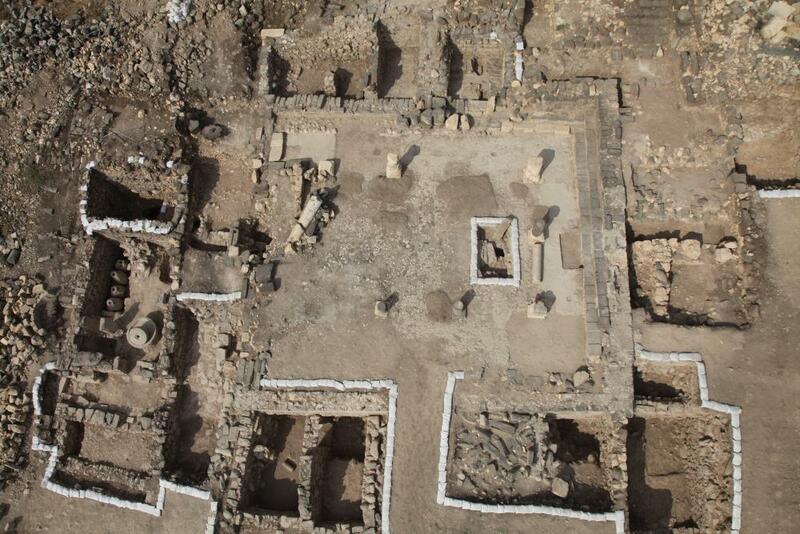 A fragmented archaeological dig covering a large area, the ruins of Et-Tell are thought to possibly be the ruins of Ai, a very significant Biblical city. 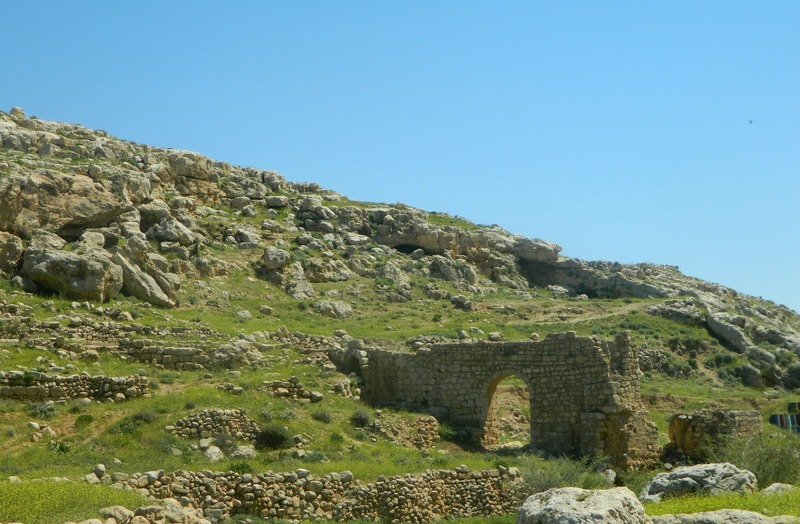 Located on a slight hill overlooking the Palestinian village of Deir Dibwan, we first came upon the ruins of a Byzantine monastery and nearby village from the Bronze, Iron and Hellenistic periods, perhaps indicating towards the importance of the site. A nearby complex of excavated structures, including many underground mikvaot (ritual baths) and olive presses, attest to a Jewish village back in Roman times. Within the large underground olive press room we found small tunnels carved out of the walls, hidey-holes in times of persecution. Rounding off the fantastic trip with one last lecture, alas! the hour was late and we had to head back to the bus (being Friday and all) and then back to Jerusalem… and from there back to Bar Ilan University for Shabbat with my dorm friends. 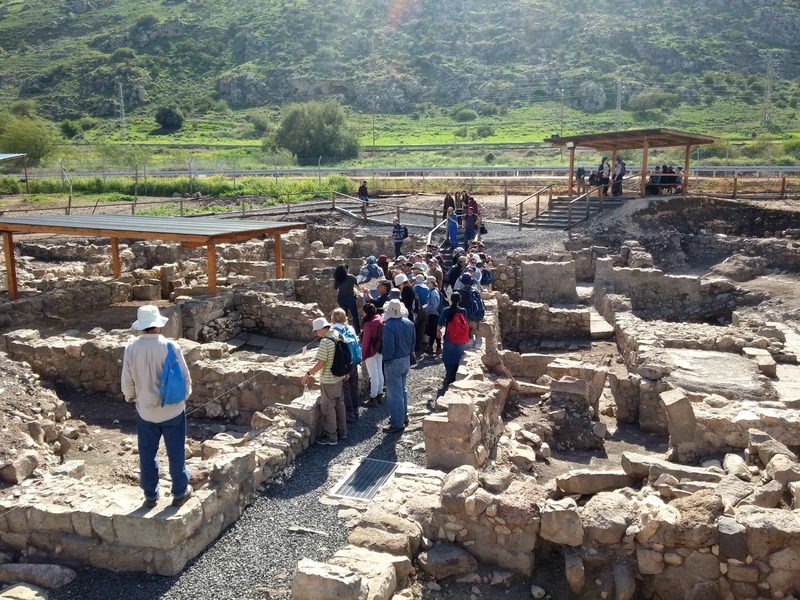 Following parts I and II of Bar Ilan University’s two-day trip to the Kinneret (or Sea of Galilee) area, our two buses drove from the scenic ruins of Wadi Hamam to the newly excavated ruins of Migdal (or Magdala). When I was visiting friends and family in Michigan a few months ago, I stumbled upon a free copy of Smithsonian magazine (Jan-Feb 2016 issue) which featured the findings of Magdala as their cover story, which I brought back home with me (see HERE). 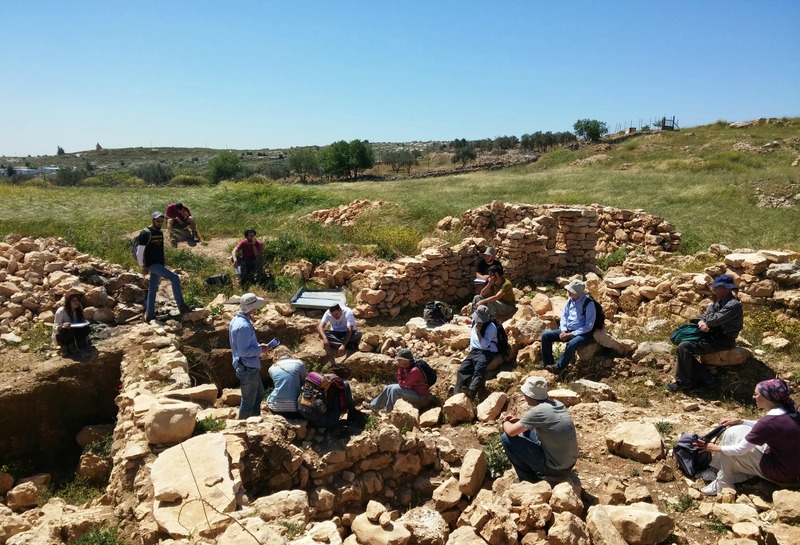 And now, on this trip, I was able to visit the much-discussed site and to hear the discovery story from the archaeologist and IAA official mentioned in the article, Arfan Najar and Dina Avshalom-Gorni, respectively. First gawking at the ridiculous souvenirs for the myriads of religious tourists, such as tiny vials of “synagogue sand” or “Sea of Galilee water” (each for $1 apiece), we settled down for an introductory lecture on the site. At the culmination of said lecture we all stood up and walked over to the start of the archaeological park tour, showcasing the structural finds previously hidden underground. 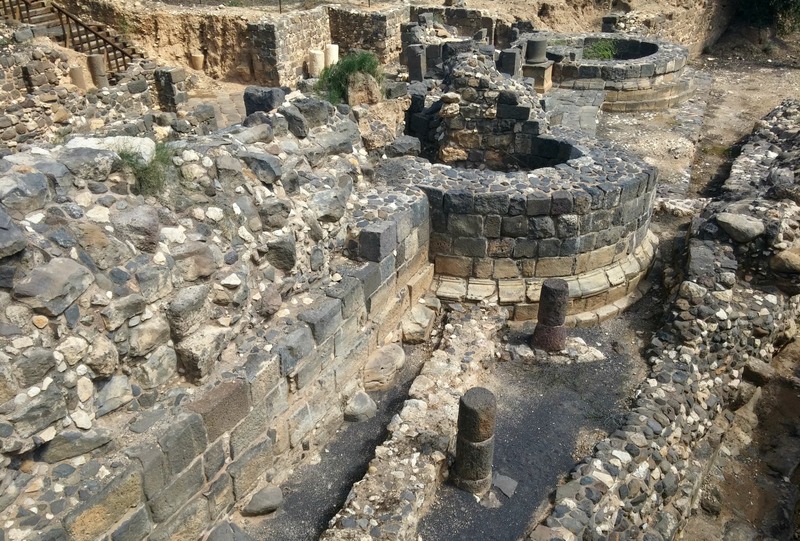 We discussed the unique findings of household mikvaot (Jewish ritual baths) in some of the houses, with the Kinneret just minutes away by foot – evidence of wealth in the village. Onwards we walked around the complex of uncovered walls until we reached the paramount discovery of the dig, a 2,000 year old synagogue with some rather interesting features. One such detail was a short, squat, ornately carved stone table which was presumed to be used for communal Torah scroll readings, a debatable assumption. 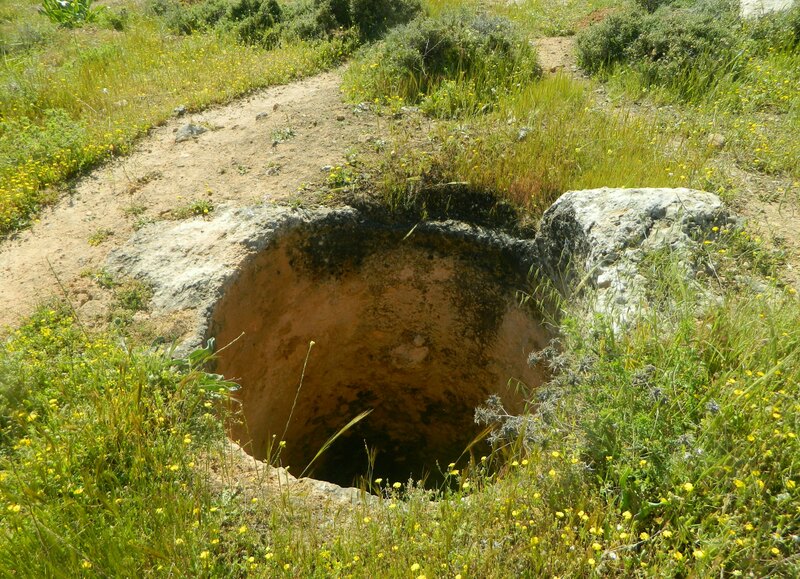 A replica of the altar-like table can be seen in the photograph below, resting on the dirt partially obscured by a broken column. 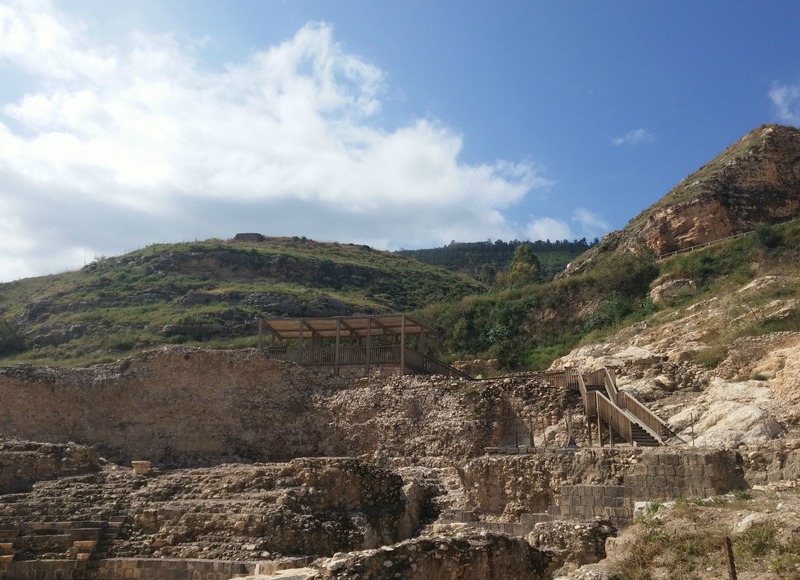 Continuing onward with the extensive ruins, we walked alongside the unfinished Magdala Resort and I took the opportunity to wander off in the direction of the richly blue-coloured Kinneret. I noticed a dark basalt complex not far south and found Najar to identify it for me; an Ottoman-era homestead with an adjacent pump house was his answer. 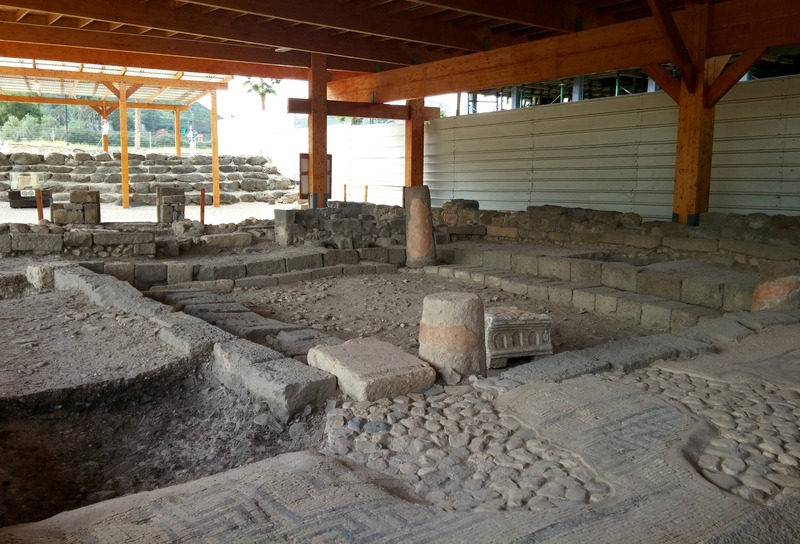 With a multitude of thanks to the guest speakers we wrapped up our Magdala visit and returned to the buses, driving north to a site I hadn’t known about: Horvat Minya. Pulling up right outside the ruins, we were greeted by a formidable limestone wall and an open main gate flanked by half-round towers. Horvat Minya is a the remains of an Islamic palace from the Umayyad period, built by Hisham, the same caliph attributed to the construction of the Islamic palace outside Jericho (the cleverly named Hisham’s Palace). Upon entering the ruined palace I was immediately swept over by a feeling of exotic adventure, like I was following in the footsteps of the lovable titular character of Indiana Jones and the Temple of Doom. Everything about the colonnaded courtyard and the atypical grass-covered floors of the rooms in the northeast quadrant of the palace felt so foreign, and I reveled in the feeling. Passing a room with a collapsed vaulted ceiling, we snaked our way through the overgrown spring vegetation and dismantled masonry. We found Persian and/or Islamic potsherds with the characteristic green glaze as well as a large stash of broken white marble of high quality. In one room, under a sturdy staircase, we found what seems to be holes made by looters, hoping to find hidden treasure troves. Rejoining the group, we visited the remains of the on-site mosque, kitchen and numerous other rooms, paying special attention to the anchoring holes on the southern wall, used to affix marble plates in efforts to beautify the room. 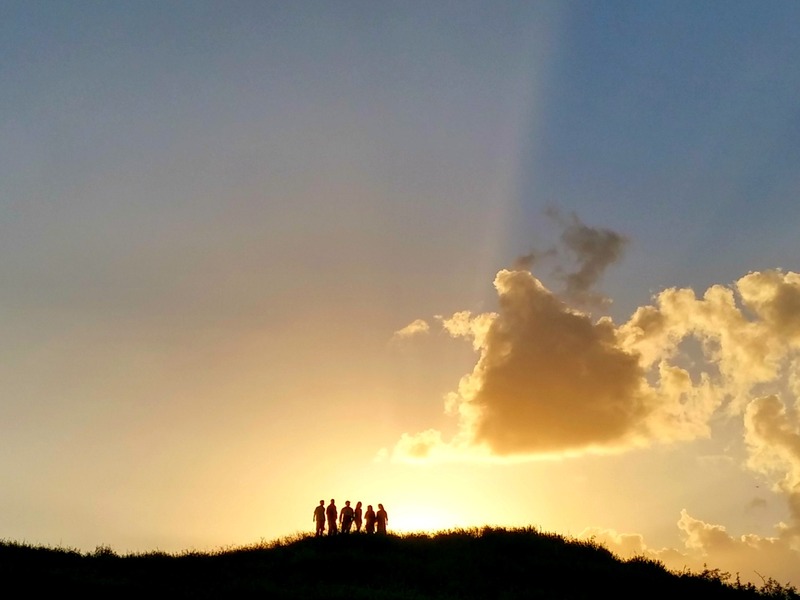 Despite the fact that we could have stayed a lot longer, the sun was setting and there was still one more site to visit: Tel Kinnorot. 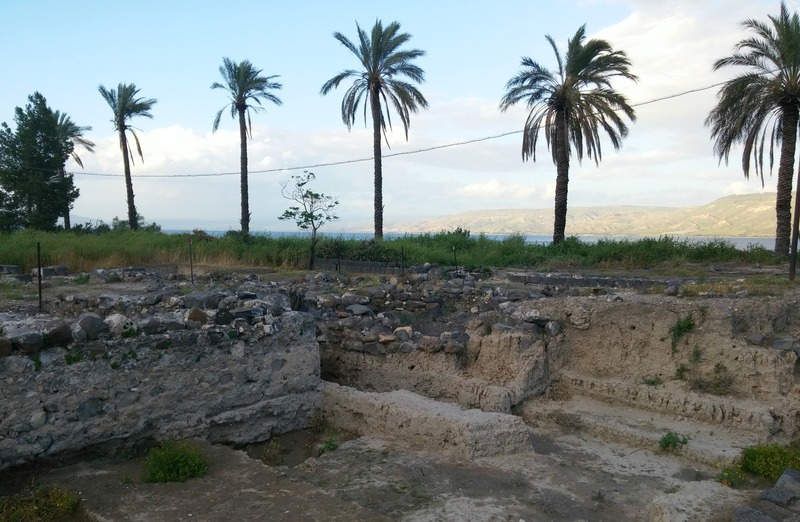 We disembarked just off the road not far from Capernaum Junction and climbed up the hill overlooking the Kinneret, reaching the excavated ruins partway up. 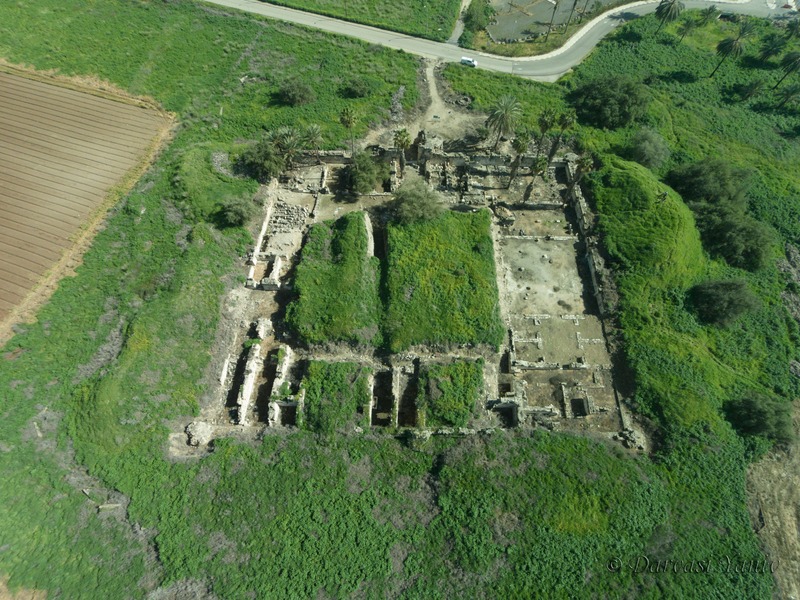 An ancient settlement that has been used in research to showcase early urbanisation, Tel Kinnorot was mentioned in the Bible as a fortified city in two separate accounts. A fragment from an Egyptian stella with hieroglyphic markings was found in 1928 and a very thorough and well composed article was written up in recent years which can be seen HERE (I especially liked the fish bit). But we stopped to visit just the gate and storage houses, if I recall correctly, where we had a lecture as the sun slipped over the slope of the tel. Continuing with my first ever university trip, a two-day affair in the Kinneret (Sea of Galilee) region, I awoke in my country lodging bed in Kibbutz Ashdot Ya’akov early in the morning to first pray and then eat breakfast in the antiques-decorated dining room. We prepared sandwiches for later and boarded the buses, eager to begin the adventures of the day. 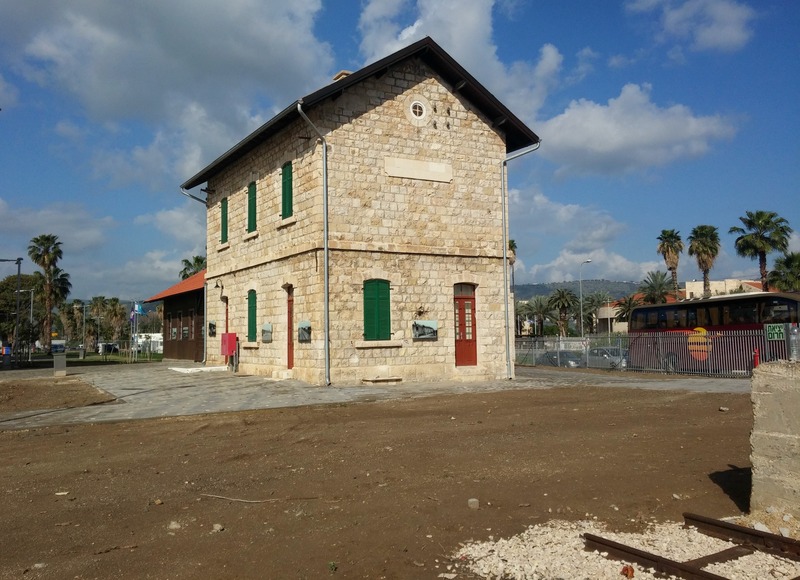 Our first stop was just minutes away, the restored Samakh (or Tzemach) train station from the Ottoman period. Samakh was the last station this side of the Yarmouk gorge before heading to Damascus and the Hedjaz region of modern day Saudi Arabia, where Mecca and Medina can be found. In order to advance both commercial and passenger transportation from the Holy Land coastline inland, the Ottoman Empire built their first station in the port city of Haifa (see post). Subsequently building stations across the land via the Jezreel Valley, the railway reached the considerable dip in elevation of the Great Rift Valley and a great undertaking was in order – the Ottomans’ largest construction feat (see map). 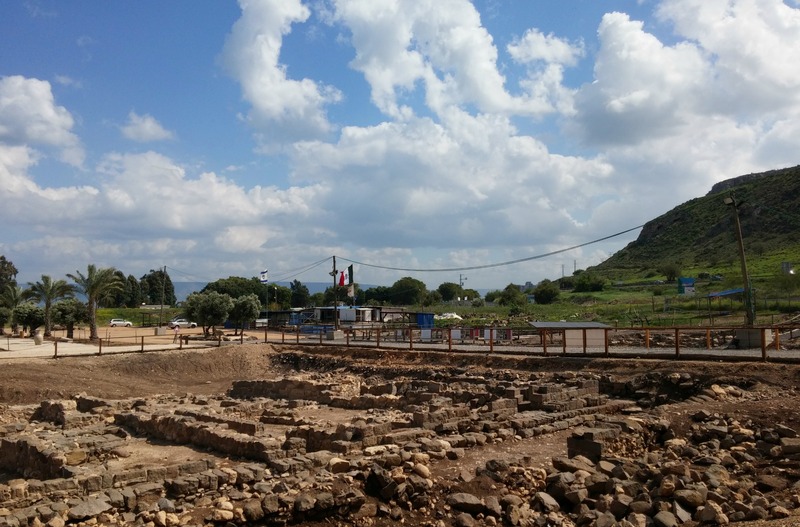 But even with a topic as interesting as the old Hejaz Railway, time was of the essence and we were hustled back onto the buses and driven to the next site on the list, Berko Archaeological Park in Tiberias (also known as Tverya). 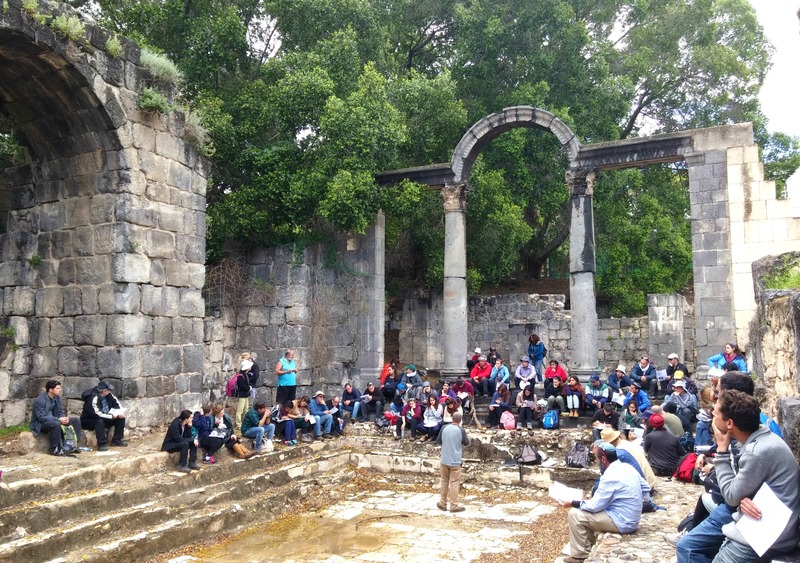 Skipping the history of Tiberias, which can be found in the above-linked post, we headed straight for the Roman theatre at the base of Mount Berniki – a large venue for live performances with some 6,000 seats. We had fragmented lectures given at different vantage points around the sizable theatre and then we moved on to the next ruins just a few minutes away, the remnants of the drainage canal built to direct the mountain runoff during the rainy season away from the vulnerable city. Running alongside the drainage canal are the ruins of the ancient Roman city gate and Byzantine southern city walls. It was at this gate that ancient Tiberias’ cardo (main street) began, stretching northwards into the city which, in the 500’s CE, was fortified by the Byzantine Caesar Justinian. Having skipped some of the initial public buildings, including a bathhouse and a basilica, we returned to the buses for a nice drive to the picturesque Wadi Hamam. Passing modern Tiberias we turned off Road 90 under the shadow of Mount Arbel, an impressive cliff edge that claims a 110 metre (360 foot) drop. Disembarking across from the colourful Arab village of Wadi Hamam we started our way uphill on an unmarked trail, heading for the archaeological dig of Horvat Veradim, better known as the ruins of Wadi Hamam. We passed large swathes of wild mustard, dotted with the occasional scarlet pimpernel while barn swallows swooped gracefully overhead, feeding off the bugs attracted by the cows and the flowers. 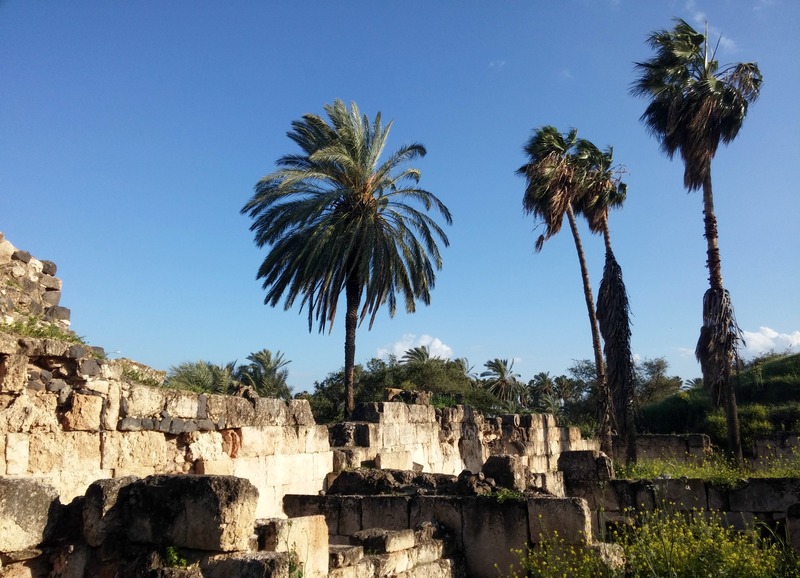 The weather was beautiful and the hike itself was pleasant and short; before long we arrived at a flat stretch with the walled remnants of an ancient synagogue, complete with broken columns. Perching on stone steps I settled down to hear a lecture about the significance of this synagogue, as well as the unique mosaic floors uncovered (of which I saw one just recently in the Israel Museum of Jerusalem). During this address I was handed two small bits of broken glass which sparkled in the most delightful way. 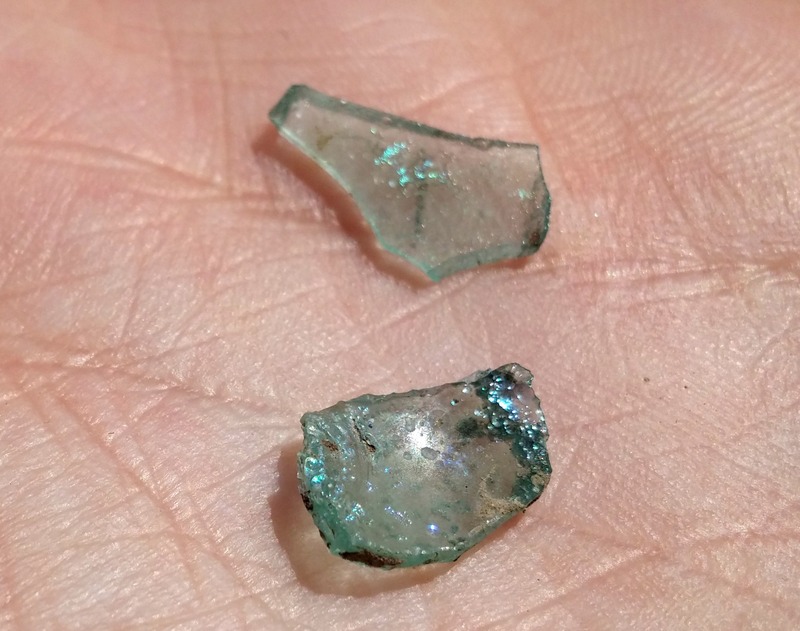 Having visited the Israel Museum last week I learned that the beauty of the sparkle is actually just iridescence caused by the glass’ deterioration, also known as silver weathering. I was unable to secure any guesstimation as to the glass’ age or maker, due to the fact that the bits are not indicative pieces are thereby essentially worthless. 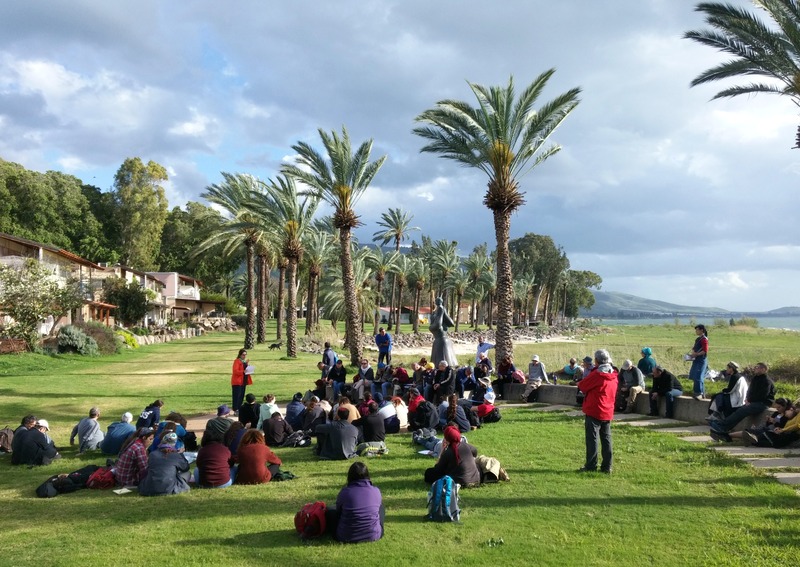 With that we reassembled ourselves on the buses and took off for the next site, just at the end of the road on the banks of the Kinneret – ancient Migdal (or Magdala). The week before last I attended my very first university trip, having just started studying Archaeology in Bar Ilan University. 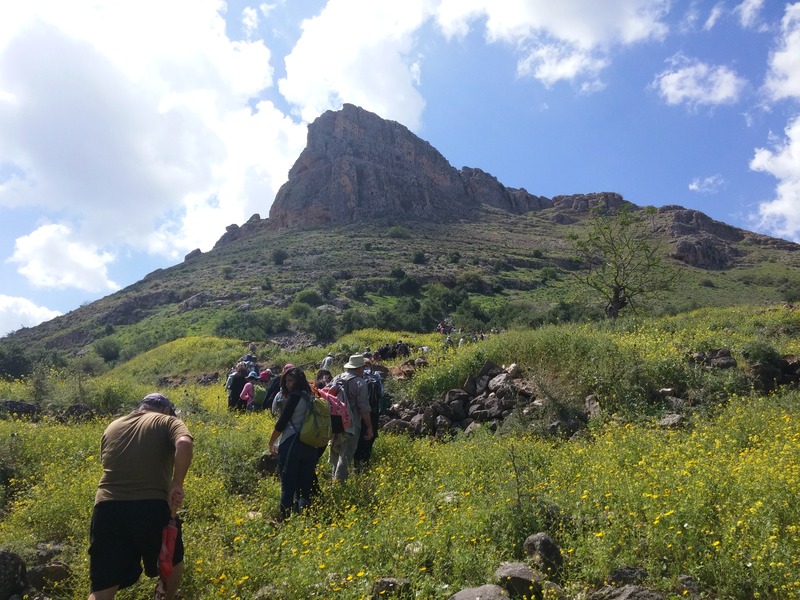 This trip was to be a two-day adventure around the Kinneret area, hopping from site to site to explore and to hear brief lectures from the various resident academics as well as special guests. We left the Bar Ilan campus in the morning, our buses taking Road 6 and then passing Megiddo, Afula and Kfar Tavor before entering the beautiful green valley of Yavne’el. Our first stop was just minutes later, at the Hod Lookout beside a monument dedicated to the early androcentric settlement of Beitanya. Next we drove to a site that I’ve read much about, yet never really seen – Karnei Hittim (or, the Horns of Hattin). 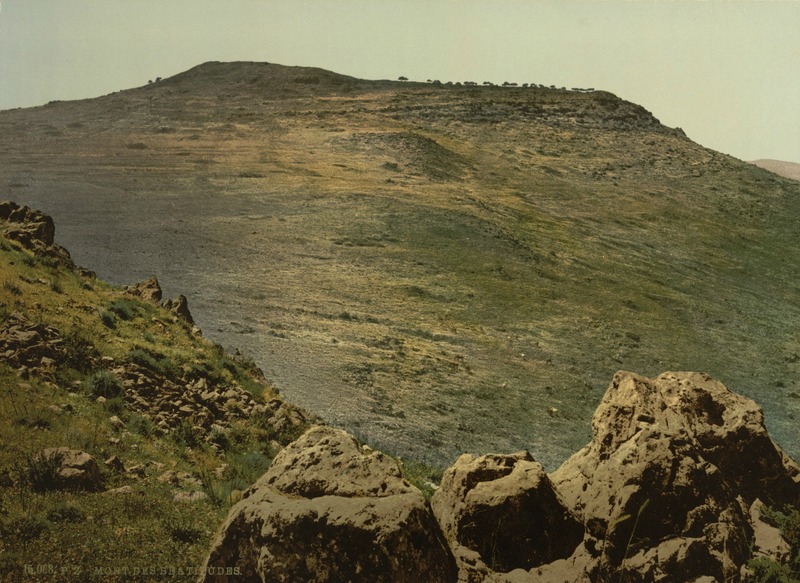 Known for the famous battle between the Crusaders and the Ayyubids under the leadership of Saladin, this extinct volcano was the battlegrounds that held testament to the Christians’ first major defeat back in 1187. Following the lead of Dr Rafi Lewis we skirted the east side of the gentle slope and made our way through a brief rainshower to the obscure ruins of Kankuzah. Rafi, an archaeologist specialising in battlefields, proceeded to tell us all about the deciding battle that was fought to the west of us, and how he conducted numerous light digs of the general area finding all sorts of military artefacts. 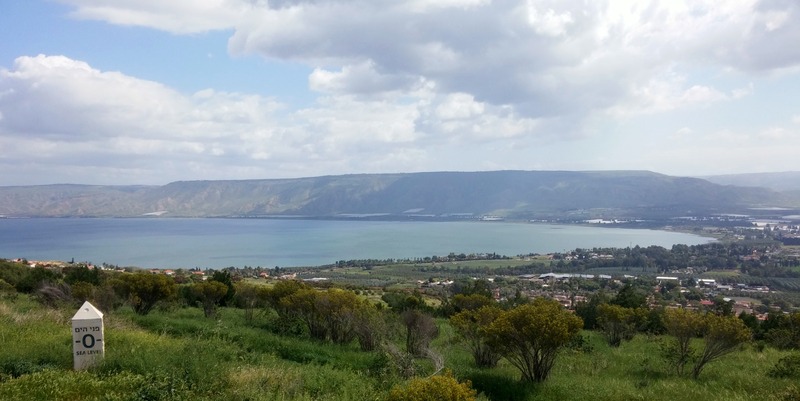 At one point he held up a printed version of the picture embedded below, a photograph from the 1890s listed in the Library of Congress as the Mount of Beatitudes (Capernaum) which has since been “historically relocated” to the area where the Jordan River spills into the Kinneret. 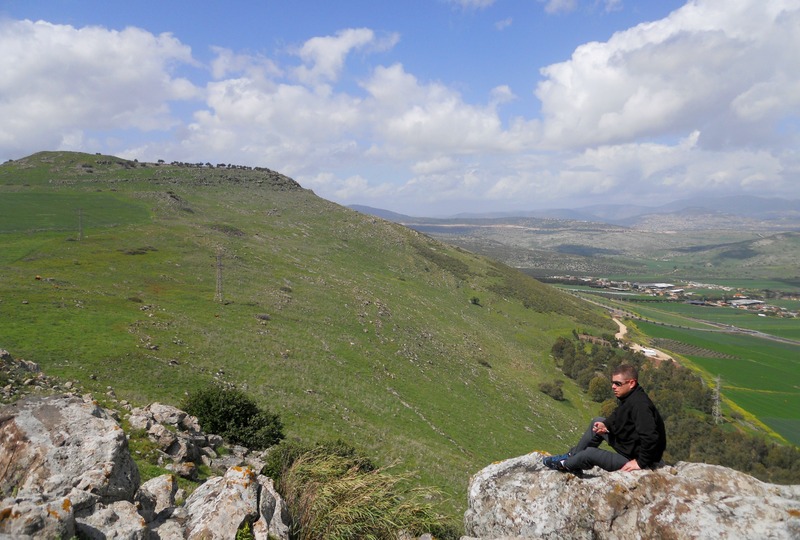 Leaving behind the beautiful view of the Arbel Valley, we walked back to the buses passing large green fields of wheat. 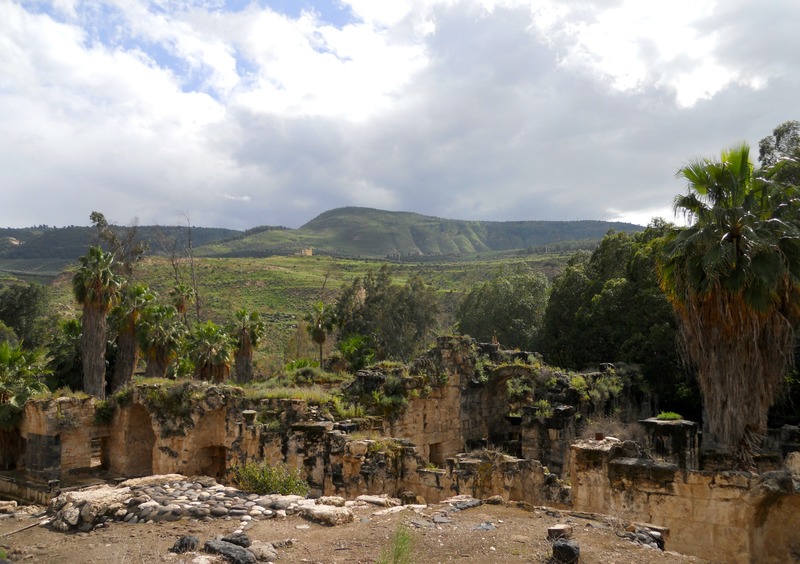 Next we drove back down to the Beitanya area, headed for our next destination: the Roman bathhouses of Hamat Gader. I had the opportunity of visiting Hamat Gader back in 2012, but then I was only able to marvel at the archaeological ruins from the plebian side of the fence. Being a university trip, even key points of interest along the way to Hamat Gader were pointed out, including the famous ruined bridge and sites along the Yarmouk River, bordering the country of Jordan. Once inside the resort, famous for its hot springs and crocodile farm, we were ushered directly to the Roman ruins. 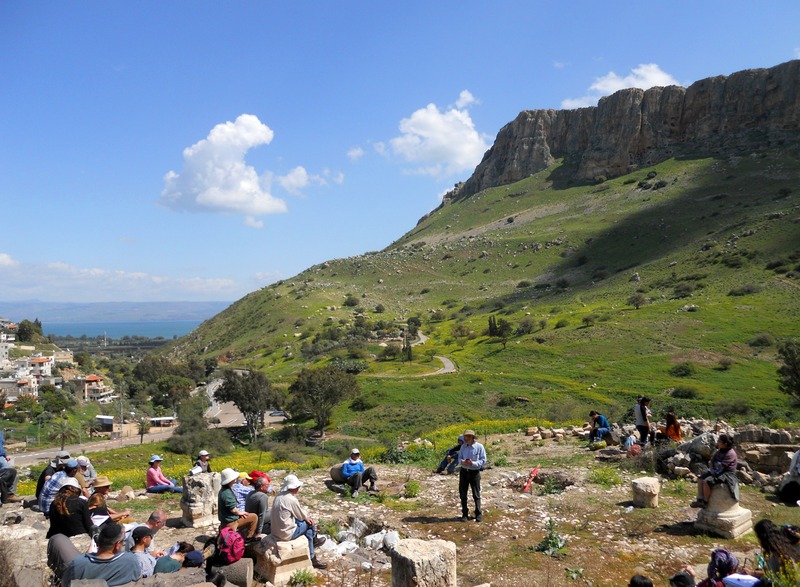 Across the Yarmouk, under Jordanian sovereignty, is the mountainside ruins of Gadara – a once important city that had close ties with the population living beside the hot springs. 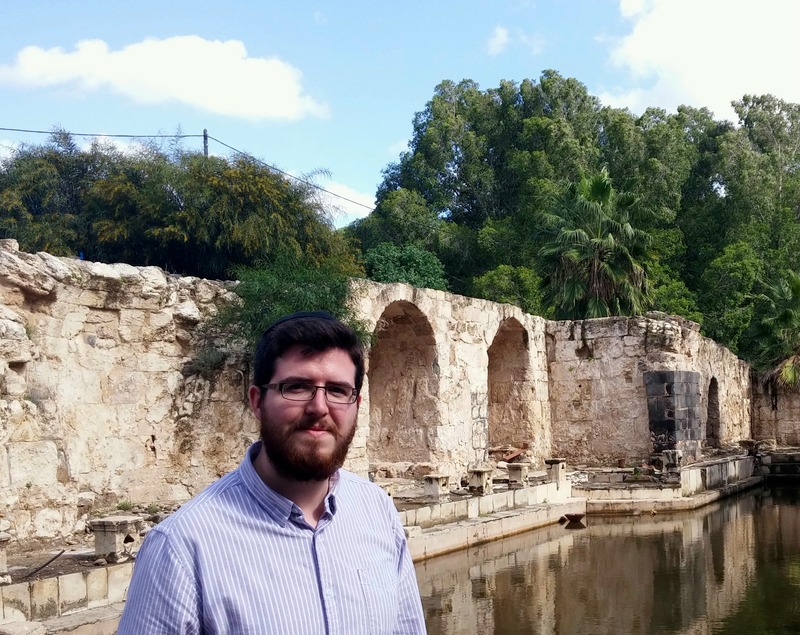 In class the other day I learned about the Roman plumbing technology used in these bathhouses, and the small stone cubes lining the pool behind me in the photo are actually small fountains all connected by a pipe under the stonework. Iconoclasm lent to the destruction of the faces on the stone cubes, the mouths of which would spout water. Ever under the watchful eye of the head of security, our group walked carefully from room to room, taking in the classic beauty. At last we settled down in the stately Hall of the Pillars for a few brief lectures. Wrapping up at Hamat Gader we drove up the Golan side of the Kinneret to our next point of interest, Ein Gev. One of the first kibbutzim to be established in Golan under Syrian authority, the success of Ein Gev was a powerful message to all parties involved. Leaving the buses, we walked to the grassy lakefront and sat beneath the gently swaying palm trees settling in for another lecture. 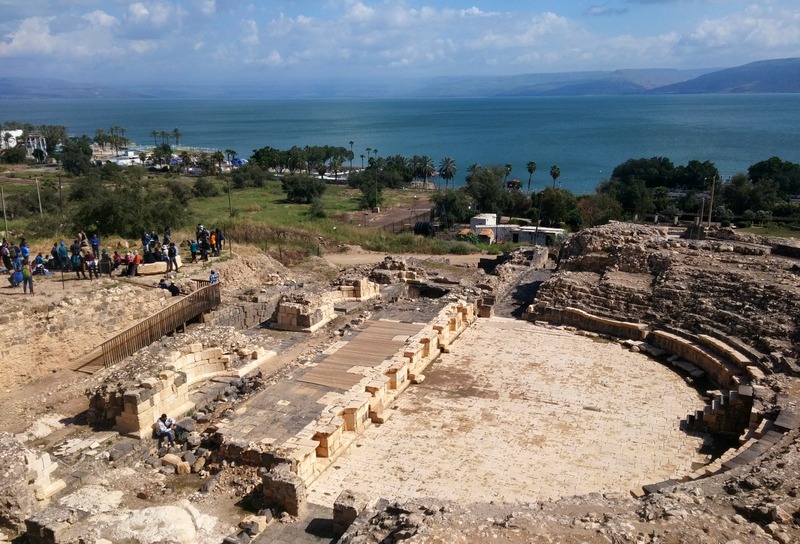 With still so much to see, we were hustled back onto the buses and driven to an ancient site on the banks of the Jordan at the southern end of the Kinneret, a site known as Tel Bet Yerach. I had tried visiting Tel Bet Yerach on my trip to Belvoir, yet couldn’t seem to find the archaeological discoveries. And so, as we crossed the Jordan after Degania I recognised exactly where we were headed yet didn’t know until that moment that the whole elevation was considered the tel of Bet Yerach. The archaeological site is quite in depth and we were given photo-copied maps of the dig to properly understand the layout. Tel Bet Yerach’s name is thought to originate from the inhabitants’ worshipping of the moon, or perhaps of the pagan moon god Sin (which may be connected with the huge moon-shaped megalith Jethro’s Cairn some 30 kilometres away). 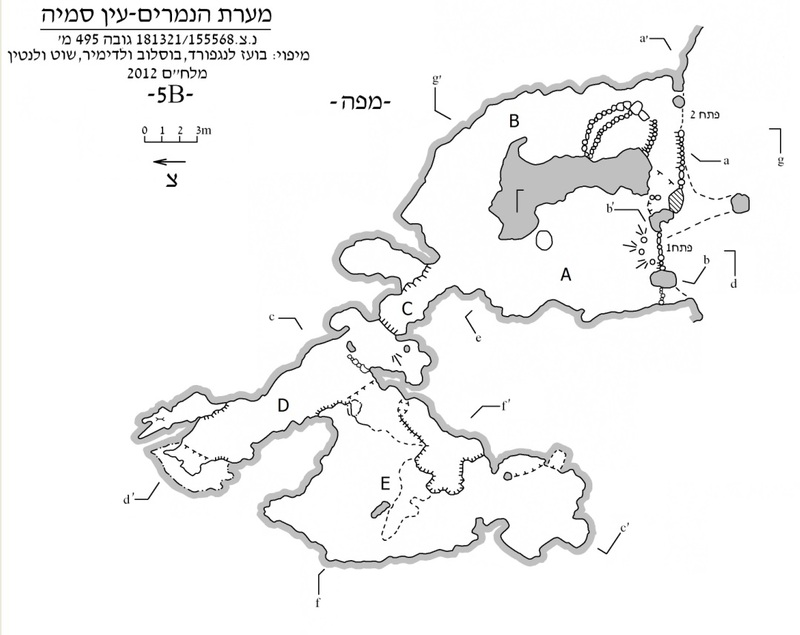 With the Jordan and the Kinneret flanking the massive stone fortifications, Bet Yerach became an important and highly protected regional city. Flourishing during the Canaanite and Egyptian periods, the city was then destroyed and then rebuilt way later during the Persian era with the Greeks and Romans augmenting and improving the city in their times. One of the lecture topics that interested me most was the unique pottery belonging to Tel Bet Yerach, a distinct black and red that is only found elsewhere in the Caucasus region. 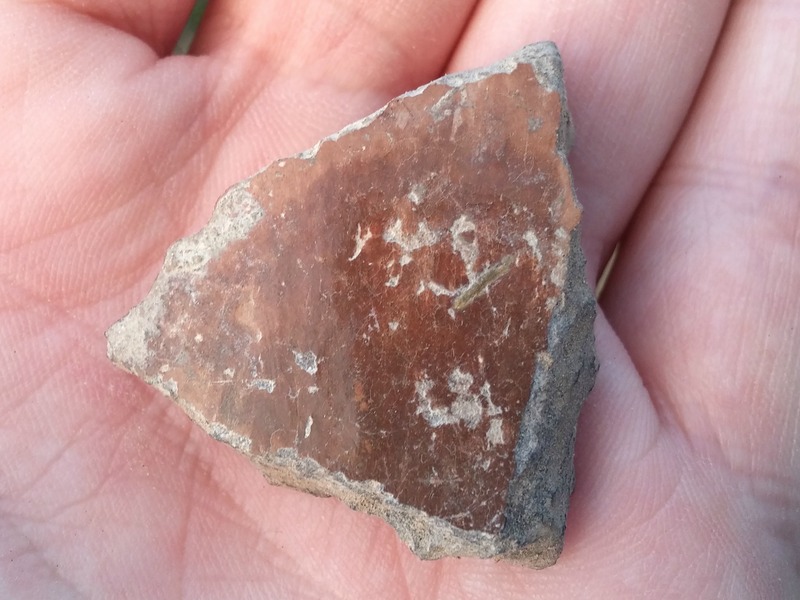 As Professor Aren Maeir spoke I scoured the ground looking for potsherds that matched the description given – the piece I found and rubbed clean was declared to be from the Early Bronze Age III (some 4,000 years old or so). 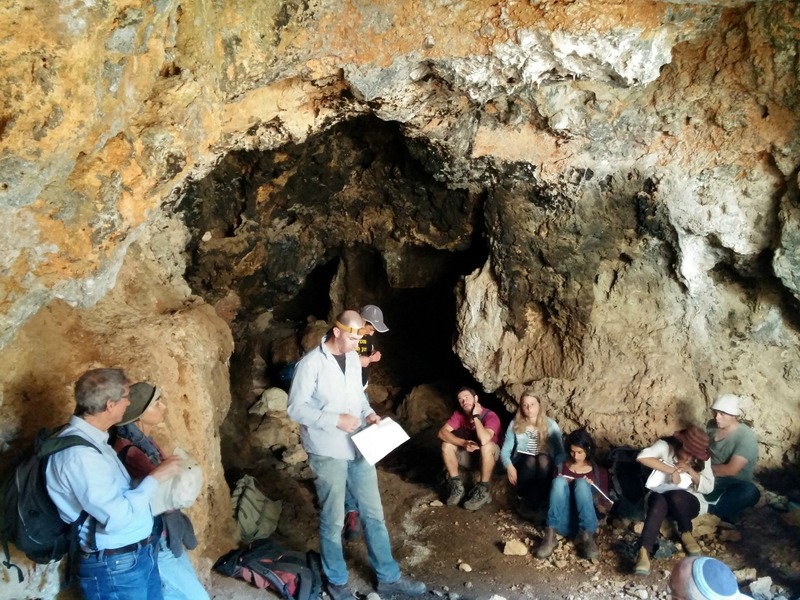 With daylight waning we had one last lecture, given by Professor Ehud Weiss, on the Ohalo II site which made headlines providing rare evidence of food sources as well as early dwelling structures. 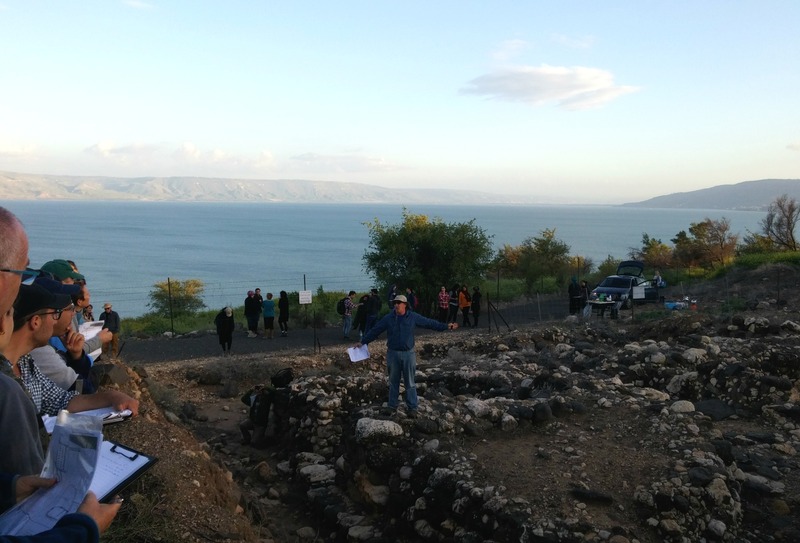 Unfortunately darkness was upon us before we were able to get a good look at where the ancient site is located on the banks of the Kinneret, but the information given over was very eye-opening. Boarding the buses one more time we were driven to Kibbutz Ashdot Ya’akov where we were set up in quaint country lodgings for a night of trivia, academia and, of course, much needed sleep to prepare us for the next day.